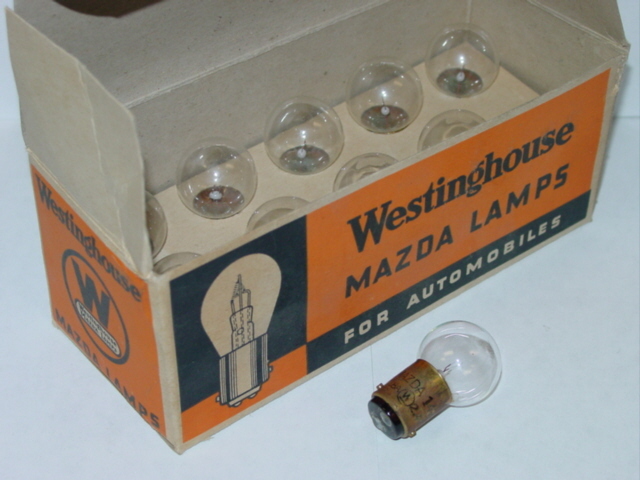 Original unused boxes of ten Westinghouse Mazda #1491 automobile lamps (.8 amps, 2.4 volts) for the antique automobilia collector or antique car owner. Each original orange and black Westinghouse Mazda cardboard box (6 1/2" long x 2 1/2" deep x 2 1/2" high) holds ten unused bulbs in a cardboard insert. The end of the box indicates that these are G8 bulbs with DC bayonet base.